This is the sort of music that gives Reger a bad name. If you look at the scores for these two organ suites (they're on IMSLP here and here), you'll find long, rambling movements, seemingly obsessed with Baroque counterpoint, but largely indifferent to the civilising influence of tonality. Or that's the stereotype that Reger's detractors would have us read into this music. These suites, and the first in particular, may live up to that image on the page, but it is up to the performer to convince us that they are worth hearing nonetheless. The young German organist Kirsten Sturm takes a sensible approach to this seemingly thankless task. She's not in the business of disguising this music, or of pretending that it is any less megalomanic than it clearly is. Rather than glossing over the contrapuntal density, she does everything in her power to draw the ear into the interplay of voices. She is working on a big organ too, so the result powerful and beguiling, but always on the heavy side. The two suites date from 1895 and 1906, which me could describe as Reger's early and middle periods. 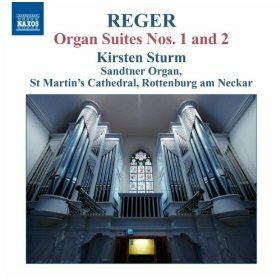 The first was Reger's first published organ work. The long shadow of Bach hangs over everything here, and the concluding Passacaglia is a particularly clear homage. Interestingly, the work is dedicated to Brahms, suggesting a more conscious historicism to these Baroque stylisations that we usually give Reger credit for. The counterpoint certainly is impressive, but the scale and structure of the work weighs everything down. On this recording the running time comes in at 45 minutes, and there are precious few let ups over that duration in the contrapuntal complexity. The Adagio second movement is one, and Sturm gives it an elegant performance with the focus squarely on the melody throughout. She has clearly mastered the considerable power of her instrument, as is admirably demonstrated by the gradual increase in weight she affords the textures through this movement. A little more rhythmic flexibility may have helped the following Intermezzo come to life, but the concluding Passacaglia is as free and flowing as anyone could wish for. And just listen to those pedal trills in the closing pages – an impressive conclusion by any standards. The Second Suite is a superior composition in many respects. At just under half an hour, its scale is more manageable. Just as importantly, Reger gives us more chances to catch our breath with a series of interlude movements between the more demanding fugues. Generally speaking, Sturm favours weight and impact over colour and transparency in her choice of stops for both works. That's certainly in the spirit of the music, and there is never any sense that the performer is seeking to correct the composer's mistakes, to lighten his textures or clarify his counterpoint. The engineering also favours atmosphere over intimacy. The resulting sound is certainly imposing and only occasionally overbearing. Personally, I'd have liked to hear a little more clarity in the counterpoint, especially in the huge outer movements of the First Suite. There are some imprecisions in Sturm's passage work as well, although given the sheer number of notes she has to contend with, these are surely forgiveable. But in general this is a traditional reading of Reger. It's not one that's likely to win the composer any new admirers, but if you already have a taste for his organ music, there's probably something for you here.